South Sudan has been plagued by a civil war that started in 2013, when President Salva Kiir accused the former Vice-President, Riek Machar, of a coup attempt. This rapidly metamorphosed beyond a power struggle into an ethnic conflict that has engulfed the entire country. The current insecurity and instability has resulted from a combination of state failure and high corruption attributed to the failed transformation of the South Sudan People’s Liberation Movement (SPLM) into an accountable ruling party. 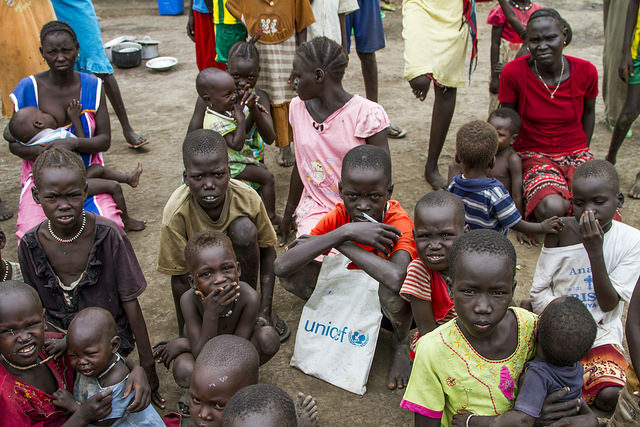 The war has brought with it a host of other challenges, including famine, food insecurity, and internal displacement, which has placed South Sudan in a perpetual state of conflict. The civil unrest and persistent violence in South Sudan has led to at least 50,000 civilian deaths as of 2016. In addition, the UN Office for the Coordination of Humanitarian Affairs (UNOCHA) reported “nearly 7.5 million people are in need of humanitarian assistance and protection across the country as a result of armed conflict, inter-communal violence, economic crisis, disease outbreaks and climatic shocks.” It is estimated that nearly one in four South Sudanese citizens have been internally displaced; and over 2 million refugees were registered in 2017. In the light of this devastation, it is clear that South Sudan does not have the capacity to deal with the impacts of this conflict on its own. Therefore, constructive intervention by the international community is necessary. The international community is a third party that can act as a more neutral buffer between government and opposition forces. Support for international involvement can be seen, for instance, with the continual requests made by the South Sudan Peace and Reconciliation Commission—a government-sanctioned committee that oversees peacebuilding within the country—for support from external actors in this crisis management. International actors have been most present in the efforts around peace and security (specifically in mediation and peacekeeping), humanitarian missions targeted at the war, famine, displacement, and monetary aid. The most prominent external actor has been the Intergovernmental Authority on Development (IGAD), which operates under the auspices of the African Union (AU). IGAD assumed the peacemaker role from the beginning of the conflict, establishing envoys to mediate talks. One of these talks resulting in the 2015 peace Agreement on the Resolution of the Conflict in the Republic of South Sudan (ARCSS), however, it did not hold in spite of IGAD deploying teams to monitor compliance. Individual countries within IGAD have also played a significant role in the unfolding crisis. For instance, the June 22-23, 2017 Solidarity Summit on Refugees co-hosted by Uganda and the UN demonstrated the role that Uganda plays in hosting displaced people. The numbers of South Sudanese refugees in Uganda has risen from 500,000 to more than 1.25 million from 2013 to 2017. Ethiopia and Kenya have played vital roles and displayed their commitment to peacebuilding in the region by hosting refugees from South Sudan. Ethiopia hosting just under 500, 000 refugees and Kenya with about 100, 000 refugees. Consequently, East Africa is the fastest growing refugee host region in the world, which shows the extent to which South Sudan’s neighbours have become involved in the conflict and affected by its by-products. Other instrumental organizations include the UN, via the United Nations Mission in South Sudan (UNMISS), who play a role in monitoring human rights abuses and violations, creating a conducive environment for humanitarian work, and giving support in the implementation of the ARCSS agreement and peacebuilding in general. The Troika Group of countries—consisting of Norway, the United States, and the United Kingdom—have complemented UN efforts by holding a variety of peace talks, especially after IGAD’s proposal in 2015 for the Troika Group to join the talks. The UN and U.S. have also employed targeted sanctions in dealing with war perpetrators in South Sudan. Finally, China and the European Union have been instrumental in sending delegates to and providing funding for the peace process. As discussed above, the actions of external stakeholders have proven to be important and much needed. The international community assists in the peace funding and humanitarian efforts. In this intervention however, the international community has focused on state and nation building. This is conducted through deals and negotiations with the government as seen in the ARCSS agreement with IGAD, or the national ownership project by UNMISS. As a result, other than humanitarian work and local issues receive less attention. Furthermore, local involvement in peace efforts are often overlooked. Given the current trajectory of the unresolved conflict as well as the challenging political context in South Sudan, the international community’s efforts have failed to exert enough pressure on the leaders to abide by the different agreements signed in past few years. Despite the negotiations that have taken place, the conflict persists. This brings the fear of South Sudan possibly being forgotten by the international community due to drying of funding, and donor fatigue and frustration at the conflict’s intransigence. The possibility of less international involvement in the future for South Sudan reiterates the need for the international community to invest also in local actors. Local actors can act as to supplement, and compliment the government’s efforts in not only ceasing the conflict, but also in working towards the longevity and legitimacy of peace efforts. Inclusivity should therefore be an important strategy adopted by international actors, state actors, and non-state actors. The international community can do so by broadening its efforts to include local level peacebuilding approaches. In South Sudan, effectiveness in the peace project will most likely be found in efforts that are based on complementary relationships and partnerships, where the comparative advantages of local peace actors and organizations are recognized and supported. Emmaculate Liaga is a Doctoral Candidate at University of Pretoria, South Africa. She was a former Southern Voices Scholar Network for Peacebuilding in Fall 2017.